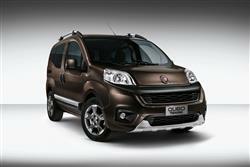 Find out everything you need to know on the new Fiat Qubo from independent vehicle review website Car And Driving. You can watch the video review to the left to see more of the car or read their written review below to get a true insight from an expert in the automotive industry. Every now and again, most families need a bit more space. What most families don't want at all times is a seven-seat MPV or 4x4 with poor fuel economy. Something that's a tight fit for underground car parks and inner city bays. What they really need is a capacious, light and easy to drive car that seats four or five, and is great at carrying kids through the week and the supermarket shopping at weekends. Plus it must be able to carry family and luggage on weekend trips, long haul holidays or to the airport prior to the family fly-away. Step forward the oddly named Qubo (a sort of Italian version of Cube). There is a reason so many car makers are turning out cuboid cars - like the Renault Kangoo, Vauxhall Meriva, Skoda Roomster, Citroen Berlingo Multispace and Fiat's own Doblo. A square box on wheels can carry an awful lot of people, shopping and luggage. If you don't fancy the downsides of permanently having to drive something bigger than you need just because you require additional capacity now and then, the Qubo could be for you. Car snobs will always put down cars like the Qubo and say that they're just vans with windows. The criticism is debatable at best, given the attention car makers now pay to designing and manufacturing such vehicles. On the other hand, there is a reason why van drivers like their LCVs so much. The shape means they can carry big loads. Plus their drivers sit up high and can see way down the road. The same is true of the Qubo, with an upright seating position that gives you a better view of what is happening ahead than most cars. It also has a carrying capacity that belies its exterior dimensions - think four wheeled Tardis. Though the Qubo is about the same size outside as a Fiesta (around four metres long), the roof gives headroom enough for even the tallest and there is legroom for four adults, let alone kids. There are lots of little cubbyholes and, praise be, for anyone who knows the joy of getting things like leaking milk containers, dropped yoghurt, melted chocolate or welly-boot mud out of pristine car interiors, there is hose-clean flooring. Wide sliding doors on both sides make access easy and with all the seats in place, the large boot (square of course to maximise the area) gives you 650 litres of space. The rear seats split-fold down 60:40 but can be taken out if you want to lug something bigger. With the seats out, you get a genuine van void of 2,500-litres, all with a low, flat loading lip and full-width tailgate to make loading and unloading a doddle. Awkward loads are also swallowed without complaint. Want to transport an adult's pushbike with taking the wheels off it? No problem, as the front passenger seat folds into the foot well. If you looking for spirited, sporty driving, then you had best look elsewhere. The Qubo's 75bhp 1.3-litre diesel or 73bhp 1.4-litre petrol units will go from a standing start to 60mph in around 16 seconds. But when was the last time you needed to sprint away from the traffic lights to get to the supermarket? In the real world, the Qubo, especially with the 190Nm of torque available with the diesel, gives plenty of pulling power to haul a car-full, makes for an easy driving style without endless gear changes and keeps up with traffic. Getting comfortable is a cinch as the steering wheel adjusts in/out, plus up/down and there is even a height-adjustable seat on higher spec versions. Go into corners a bit briskly and you will get some bodyroll but overall, the Qubo delivers mild, relaxing road manners, plenty of grip and reasonable refinement. Crucially, visibility all-round is brilliant which makes for safer motoring. The Qubo is also easy to park, and accurate steering makes for good manoeuvrability. Cheap and cheerful, the Qubo is a budget motoring winner, with Group 2 insurance and nearly 63mpg on the combined cycle from the diesel version which puts out only 119g/km of CO2 (40.4mpg and 165g/km with the petrol). If you want to save even more money, you can play with Fiat's 'eco:Drive' system. Plug their special USB stick into the car and it collects information about how you drive. Then plug the USB into your home computer and it will give you marks out of 100 for how fuel efficiently you drive, plus tutorials on how to drive more frugally. Fiat say this will help Qubo owners cut their fuel bills by up to 15%, provided you don't mind a computer doing the back-seat driving! Expect to pay in the region of £10,000 to £13,000 for your Qubo, with a £1,200 premium for the 1.3-litre diesel model over the 1.4-litre petrol version. There's an optional Dualogic six-speed semi-automatic gearbox if you go for the diesel. This pricing compares favourably with direct alternatives such as the Vauxhall Meriva or a Citroen C3 Picasso and you will need to find an extra £1,500 or so to afford slightly larger alternatives like the Citroen Berlingo Multispace or Fiat's own Doblo (but you only need consider these options if need seven seats). There is a certain funky look going on with the styling and kids will love it. In fact it's the sort of vaguely cartoonish car kids might draw with the wheels where they should be - right out at the corners - a stubby bonnet, tall roof and dramatic XXL bumpers and wheelarches. When you consider that all Qubo models get a trip computer, power steering, remote central locking, a CD stereo and the Blue&Me communications system (combining Bluetooth connectivity and voice command functions), it's obvious that Fiat have aimed at making the Qubo a genuine convenience machine. Budget priced to buy and to run, with some ingenious design touches making it an effective people carrier and load lugger, the Qubo should not be overlooked by the family that needs more than a conventional hatch, doesn't fancy an estate, but equally doesn't need the weight, size and expense of a full-on MPV or 4x4.